Happy 2016 & New Year’s Giveaway! Beyond Victoriana has been a bit quiet as of late, but I wanted to kick out the new year — and BV’s seventh year on the aethernetz — by offering a gesture of appreciation towards our readers, with the help of some generous sponsors. One limited edition spray from Nyxworks / Wild Marjoram, which was offered at this year’s TeslaCon. One wearable necktie from Redfield Designs (I’m modeling them both to show off their awesomeness). 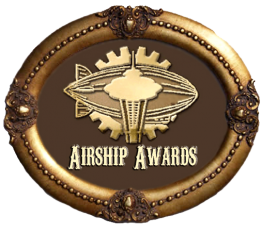 Reply to this post with a resource *you* use for steampunk, whether it be a costuming site, history book, film/documentary, website, museum, etc. People who do not include a resource will have their entry disqualified. You must also include your email in the comment info box when entering. Readers can only submit one entry per household. US and International entries are fine! Enter between January 2nd 2016, through January 10th 2016, at midnight EST (GMT -5:00). Winners will be chosen via their comment number using Random.org. Winners will be contacted via email and must reply within 24 hours with their mailing address to claim their prize. Otherwise a new winner will be selected. And that’s it! Have fun, folks, and looking forward to the coming year. Note: Congrats to Hannah R. and Kat A. for being the selected winners of this giveaway! Awesome! Saw your tweet and came to look. I’m a fan of (and, full disclosure, an occasional writer for) Steam Punk Magazine, whose run is unfortunately coming to an end with the next issue. Good resource for how-to and history, as well as other fiction and nonfiction. I absolutely love the Sleepy Hollow movie with Christina Ricci. Her blue striped gown is just gorgeous and the scientific glasses Johnny Depp uses are a source of envy. I get a lot of my inspiration from movies. Where to begin…I use a wide variety of resources from websites like Airship Ambassador, Pandora Society, and your own blog. Plus, I use “Steampunk for Simpletons” and Jeff Vandermeer’s “Steampunk User’s Manual.” I also reach out to others for research and follow various Facebook threads. I also have access to the University of California library system for research which has been enormously useful. I find Pinterest to be incredibly helpful for ideas, DIY tips, etc. Love this new year giveaway! Great giveaway! I don’t really use any specifically steampunk resource because I prefer mostly doing my own thing (I’m not pure steampunk, I mix and match rather eclectically) but I draw inspiration from a wide array of historical documentaries, literary works, tv series etc. Stuff like the cult scifi tv series Firefly, steampunk novels like Gail Carrigers Parasol Protectorate series and quite recently I watched a series of historical documentaries on Netflix called Seven Wonders of the Industrial World that I found very inspiring. What a great giveaway. I get my steampunk info from books and the FB and websites of Ihe Ministry of Peculiar Occurances and Gail Carriger. I must say, I’m not exactly sure what you mean by “resource for steampunk”; you appear to be talking about resources for *inspiration* or resources for *research*, possibly, but it isn’t clear that you don’t also potentially mean resources for *buying* or *making* steampunk items. So I’m not sure how exactly to answer, so I’ll just leave several examples to cover all possibilities. INSPIRATION: I don’t really have a one-stop-shopping kinda place I get my inspiration from. I just cruise around the internet, and when it hits, it hits. Probably H.G. Well’s classics were my initial source of inspiration, but then there isn’t anybody who won’t say the same. Right now it comes mostly from Failbetter Game’s “Fallen London”, “The Silver Tree”, and “Sunless Sea” games (all exist in the same universe). I’ve also gotten inspiration from the blog Epbot, as well. RESEARCH: I really don’t do any. I just use whatever others find, primarily from the webcomics “2D Goggles: The Adventures of Lovelace & Babbage” and “Hark! A Vagrant” which, though not steampunk in itself, has some great history lessons in it. I also have learned a lot from the Tumblr “medieval poc” which shares and critically examines representations of poc in European art history, which is useful and insightful even if it’s mostly stuff from the medieval and renaissance eras. MAKING: I usually make my own accessories, though once I sucked it up and bought a pair of goggles from a shop in Tacoma, WA. The box of gears I use were a godsend from my friend Chris, whose dad used to run a clock repair shop, and just had tons of extra clock parts laying around his garage still. Chris also gave me bronze and silver spray paint. Chris is my best friend. Oh! And I buy leather scraps from Shipwreck Beads; you can get a bagful of good scraps in assorted colors for only $6. It’s the best deal in the shop. I used that to make all kinds of accessories, including a mechanical breastplate. Sorry not sorry for the long comment. I’m only just beginning my journey into the Steampunk world. I’ve been aware of it, but never fully engaged until recently. I’ve always found inspiration in odd little places like the Steampunk emporium that sadly closed. I’m a fan of many films and tv shows like Firefly, Dowton Abbey (sp), so many I’d hardly know where to end. My historical accuracy could use some work but when I learn of inspiring notions I take to the internet or ask my better informed friends. Recently James and the cuckcoo clock heart has really stirred something in me with it’s memorable historical characters and costumes and of course it’s heart! I use Pinterest. I have three Pinterest boards, one for wardrobe, https://www.pinterest.com/ladymystra/steampunk-wardrobe/ Right now I’m trying to see how I can take a 한복 (hanbok, a traditional Korean dress) and steampunkify it..Then there is a board for steampunk shoes, but not on there is I’m trying to figure out if I should use 고무신 (gomushin, rubber shoes) or 화 (hwa) boots for my costume, I think it will end up depending on if I can easily get the boots, the shoes are pretty easy to get. And then the last board is about accessories, since I think accessories really finish off an outfit. That’s a tempting giweaway. 😀 I like the Steampunk Bible and the book “Victorian and Edwardian Fashion: A Photgraphic Survey” by Alison Gernsheim is very inspiring. Online I have the Rauchersalon, the german Steampunk online community. Oohh!! I did a huge research project on steampunk and morality a few years ago, and since then I’ve been using Steaming Into a Victorian Future: A Steampunk Anthology (ed. Julie Anne Taddeo and Cynthia J. Miller) as a research base for almost everything. It has a number of essays on a wide variety of issues, from the role of technology in history to the way femininity is re-imagined in steampunk literature. Since this book is largely analyitcal/theoretical, for me it makes a good jumping-off point to start on any other project. I am an indie steampunk author, and I also get much of my info and inspiration from the Scribblers Den. It’s a fascinating place to be for a writer! My favorite steampunk resource is the local (Madison, WI) TeslaCon convention. The movie “The Prestige” is a Steampunk resource. There are 2 sources that I really like. First one is the book Vintage Tomorrow from James Carrot and Brian Johnson. They do a great job of giving the ins and outs and roundabouts of Steampunk: what is, how it came about, and the various threads it has. This brings me to my next one: Threadbangers. Steampunk is a hands on, DYI, type of movement. But what about those of us who have to learn how to DYI? Threadbangers did a whole week of Steampunk and showed how to sew and make several steampunk essentials. They also have many ideas that can be tried. So for those who what to do more DYI, this is my favorite. Great giveaway!! My two resources are AnomalyCon, and the photo collection at the Denver Public Library (http://digital.denverlibrary.org/cdm/photographs/). Thanks for the opportunity! Vanitas no Carte! Also the steam train books my dad has from the turn of the century. Amazing giveaway, and fantastic start to the new year. as for the resource I uses is The Anatomy of Steampunk: The Fashion of Victorian Futurism. Its a fantastic book and gives a lot of incite.